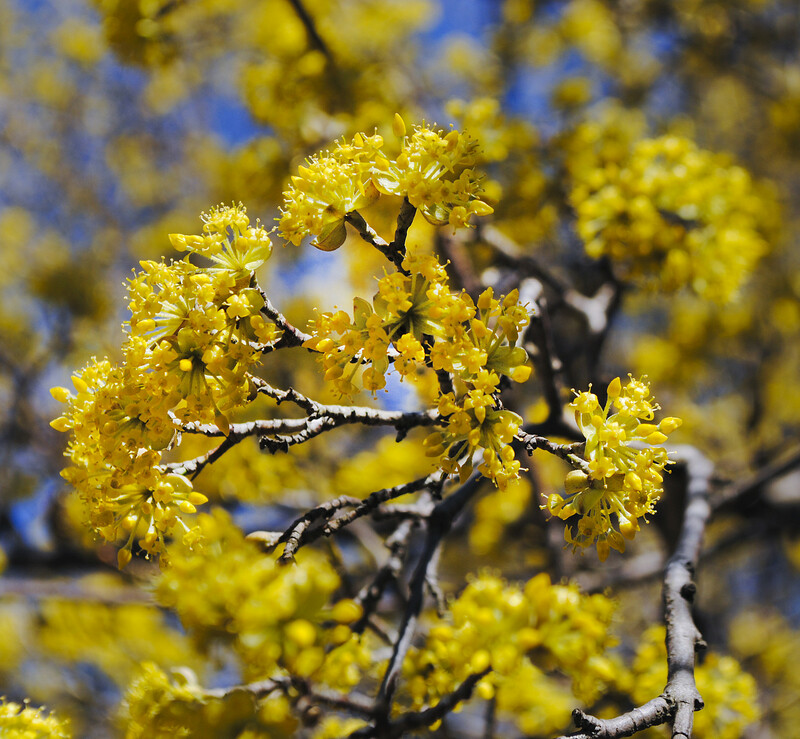 Cornus mas, also known as cornelian cherry, is a small tree, 15 -25 feet tall, native to Europe and western Asia. Its ornamental value is in the flush of showy yellow flowers in early spring, followed by the bright red edible fruit(cherries) later in the season. 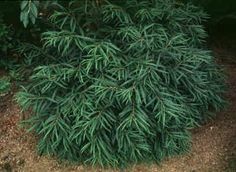 Some selections have striking leaves of gold or variegated edges. Older trees also display colorful exfoliating bark of gray and brown. This characteristic is better viewed if the trees lower branches are trimmed up from the ground. The fruit can be used to make jams, sauces, and is also enjoyed by a variety of birds. 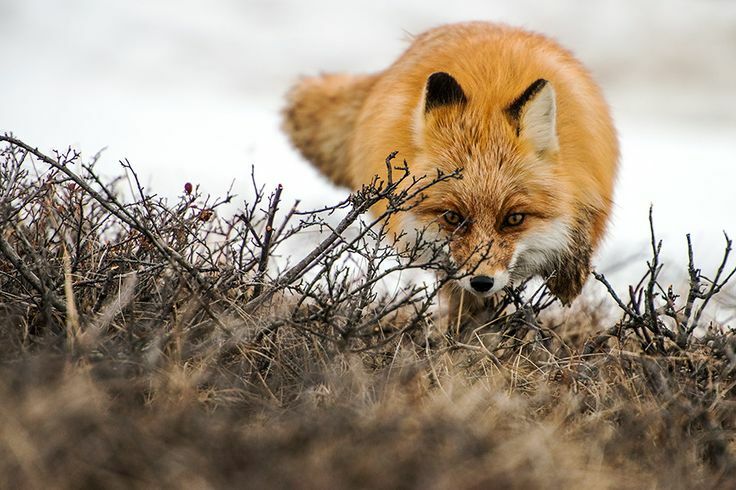 It is deer tolerant and seldom bothered by pests and other maladies. Hardy to zone 4, full sun to part shade is the preferred siting in a variety of soils that do not dry out. Of the many cultivars available, those with all yellow or heavily variegated foliage, are best grown with more shade to avoid scorching. The fruit shows more brilliantly against a lighter colored leaf. A few cultivars that are grown for heavier fruit production are ‘Elegant’, ‘Pioneer’, and ‘Redstone’. We grow and sell Cornus mas here at the nursery. Because of its spring flowering, attractive foliage, and berries in the fall, it’s an another lovely specimen for the landscape. 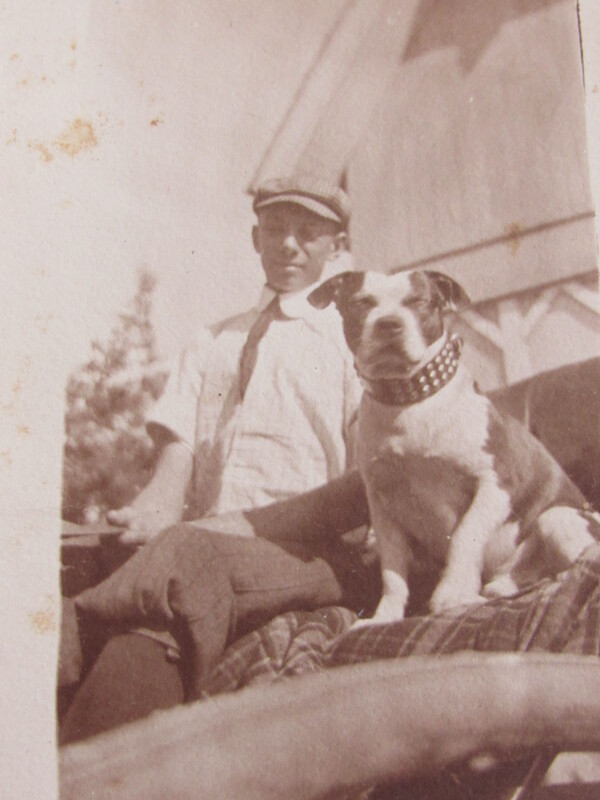 I have spent some time this winter sorting through photos and documents from my father’s side of the family. My mom passed them on to me a few years back (thanks, mom!) and I am trying to organize them into chronological order. Much of the work is done, our history has been well documented. Occasionally, however, I come across an old photo with no name on it and this always makes me sad. It is often one that stands out from all the others, so there is nothing to compare it to. Who is that young lady? Who does she belong to? 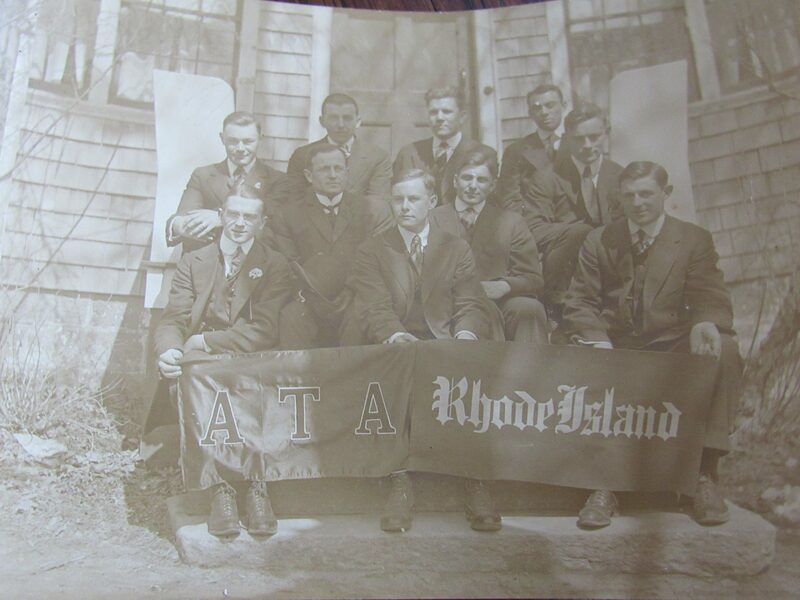 While rummaging through the boxes I came across a program held at the University Of Rhode Island. My grandfather, Owen, attended the university for agricultural sciences back in the 1900’s (he came from a long line of farmers). 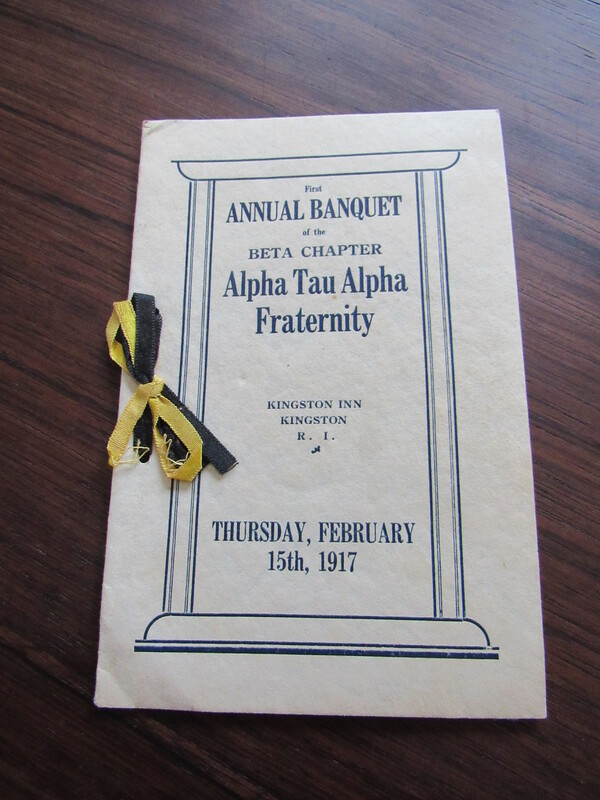 As you can see, it was the first annual banquet of the Alpha Tau Alpha fraternity in 1917, which my grandfather apparently belonged to. I’ve posted a picture of the leaflet describing the ‘after the meal’ lectures. 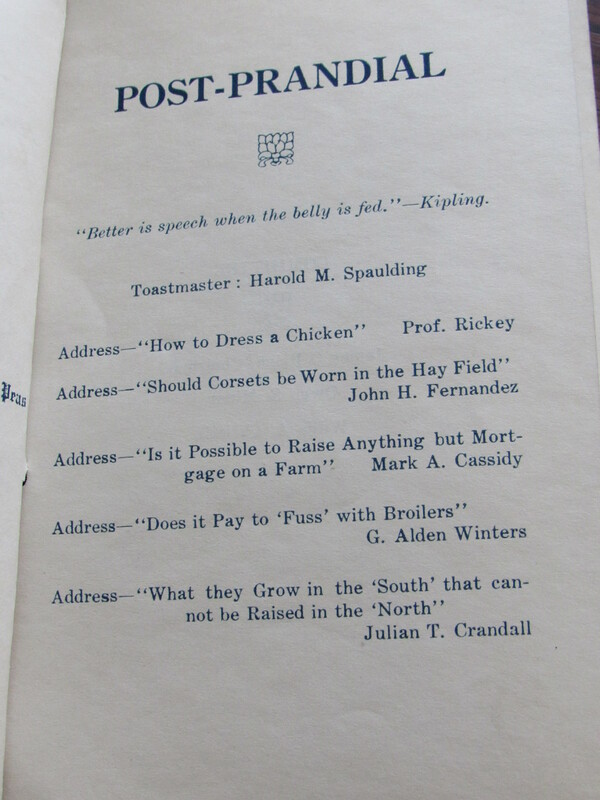 I was quite fascinated by the address given by John H. Fernandez on “should corsets be worn in the hayfield”. How does he know, is he wearing one? I researched a little and found that it was possible…Corsets for men were typically made from a lightweight cotton. The corsets laced up the back and often had buckled straps at the side to prevent the abdomen bulging. You can’t be efficient in the hay field if your abdomen is bulging all over the place, no sir, let’s hold that tummy in place! Corsets for men? This I never knew, but I did get to thinking about how convenient it would be if men (and women) were wearing their corsets in the hayfield, how handy if the old baler broke a shear pin and the answer to fixing it was tucked into your girdle. 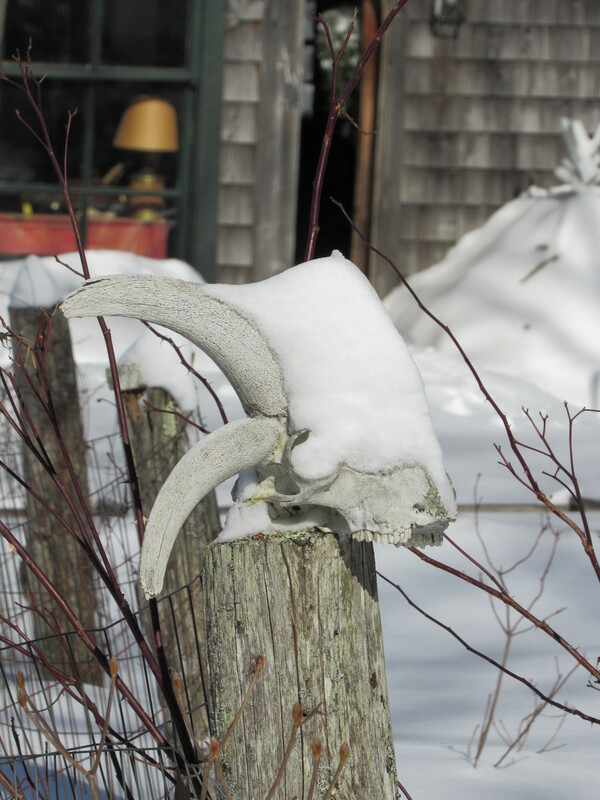 Making do with what you have, you might say….how old-timey and innovative is that? 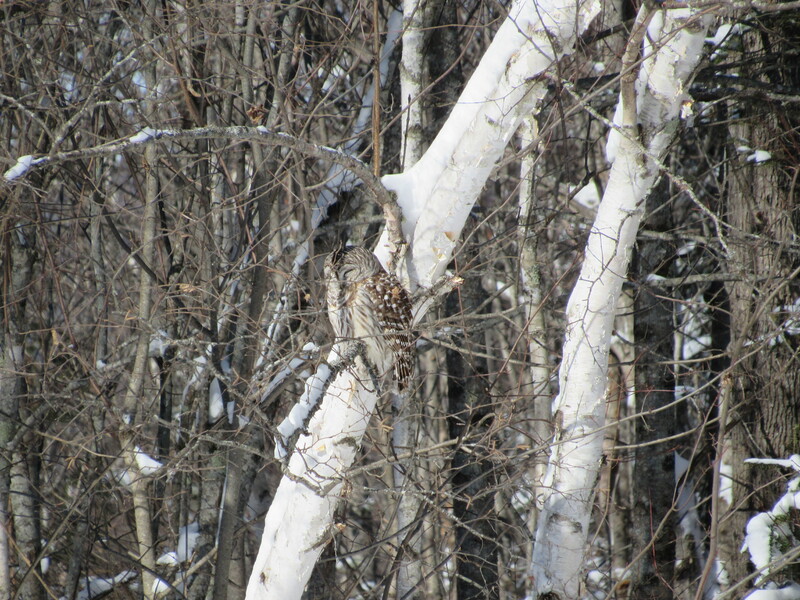 More snow, more shoveling, more visits from our owl friend. He (the owl) watches us from his favorite perch. He can scan the whole layout from where he sits…the house, the chicken coop ( no doubt that is what he’s most interested in), the greenhouses. He doesn’t fly away when we are out working. He remains still, turning his head ever so slightly, to keep us in view. I’m glad he’s here. I’m o.k. 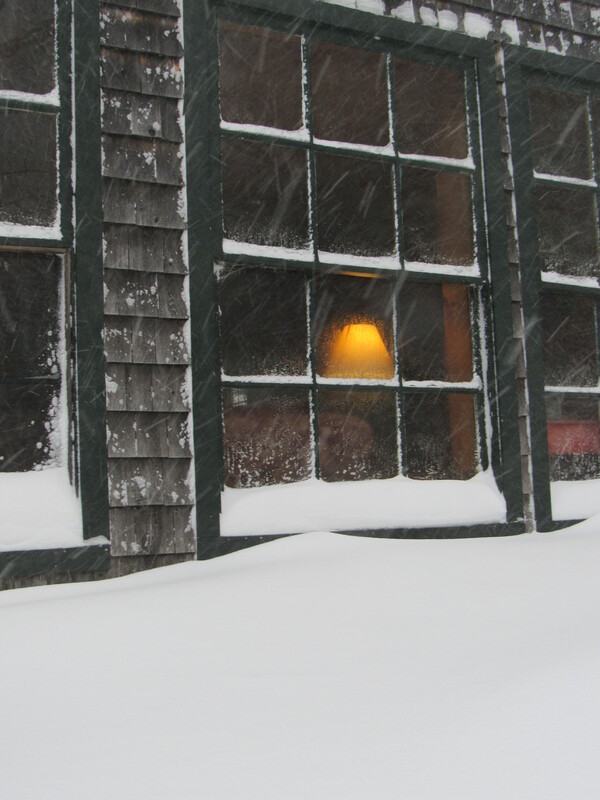 with more snow. 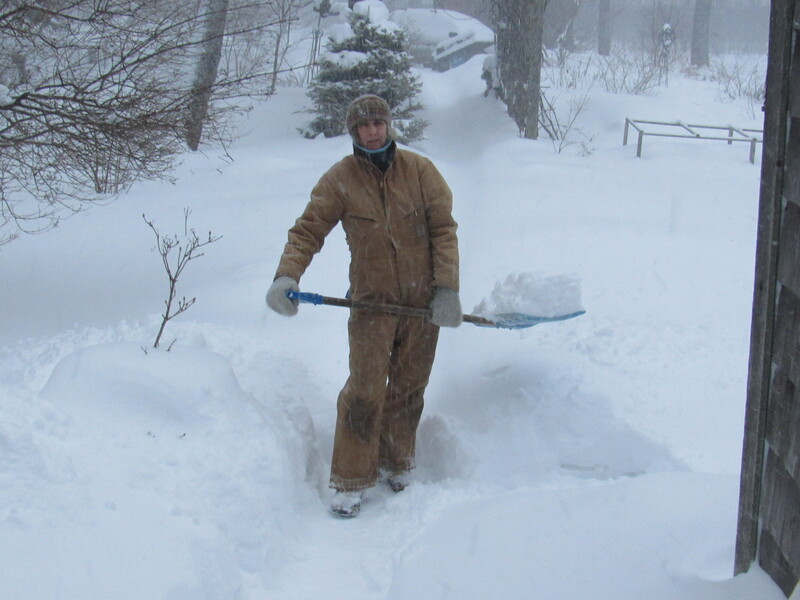 The shoveling?…keeps us fit. This morning while gathering extra bales of hay from the big barn, I couldn’t help but take advantage of the slick snow covering on the field behind the barn. Out came the Flexible Flyer, down came the earflaps on my wool hat, and off I went. 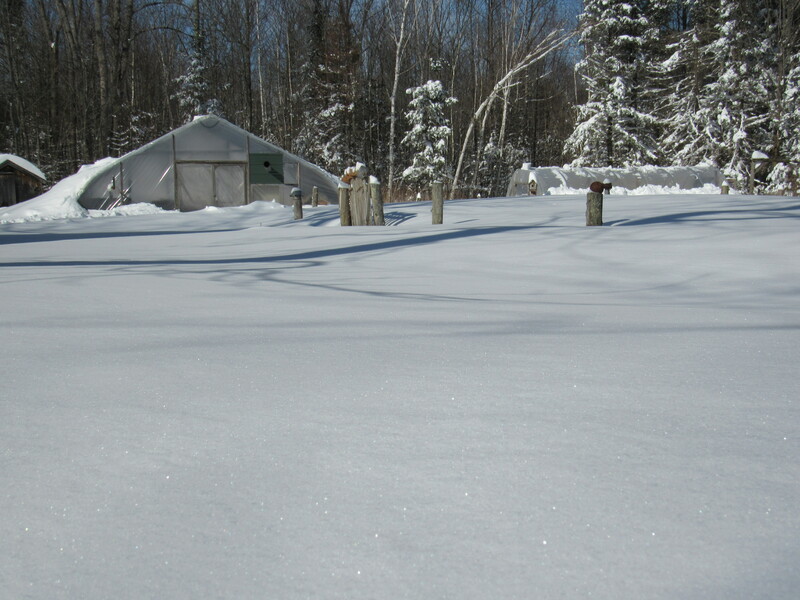 We’re getting more snow at the moment and chances are it will cover the good icy sledding snow with a more powdery consistency. Well, I wasn’t going to let good sledding snow go to waste! Halfway down the hill, I passed over a spot that had been pawed bare by the deer. My eye caught what looked like a sharp branch. 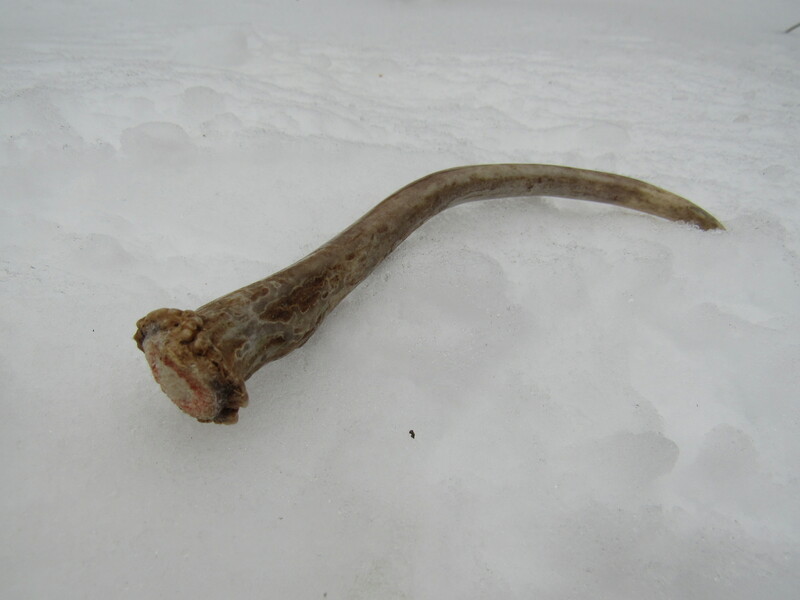 I hiked back up to investigate….and I found this single spike horn (antler). How lucky! 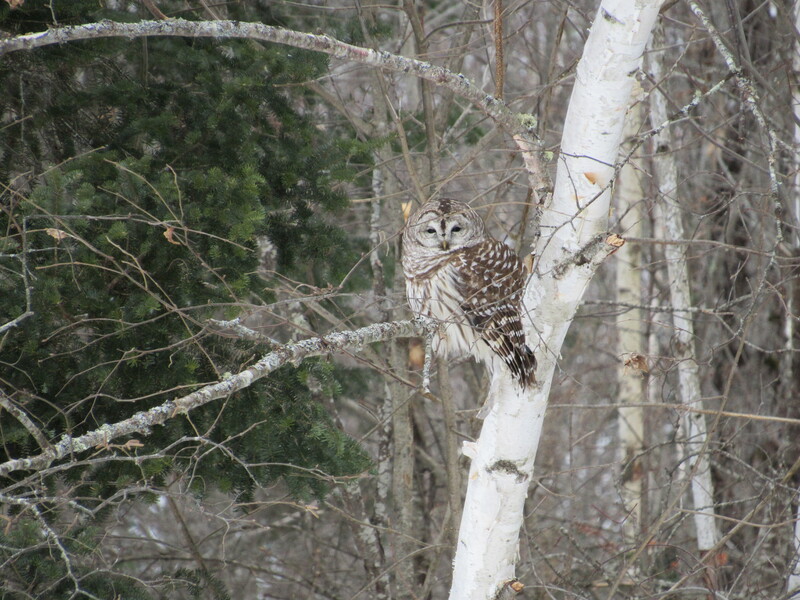 Then!…then!….I came home to find this guy sitting in the tree just outside the sheep barn, no doubt hoping for some rodent activity to satisfy his appetite before the storm really takes hold. All before 10:00 a.m. What a lucky day! After a morning of outdoor chores, I came in to do some computer work. Mostly looking back over photographs and sending them off to a magazine that will be featuring the nursery this spring ( more on that later!). 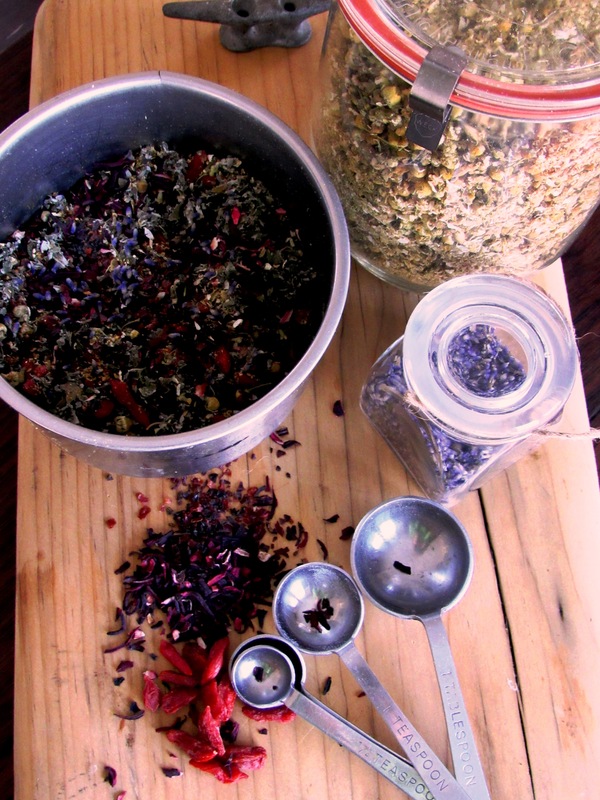 While scanning through the many, many pictures we’ve taken, I came across this photo; a pot of blooming tea gifted to me last winter. I remember that day. My very dear friend Sid had come over for some knitting and a chat and she brought us the blooming tea to enjoy together. 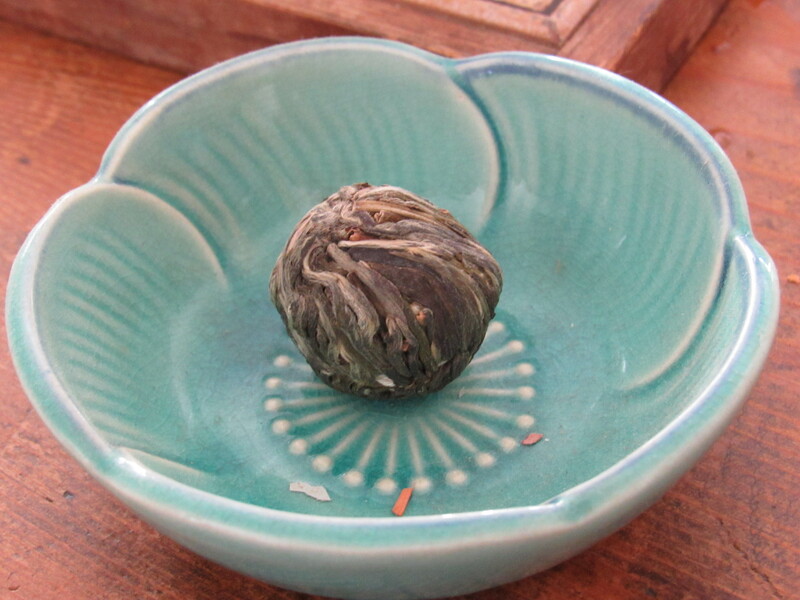 Flowering tea or blooming tea is a small bundle of dried flowers encased in tea leaves and left to dry. After we covered the bundle of dried herbs and flowers with boiling water, we sat mesmerized as it ‘bloomed’ in front of us. 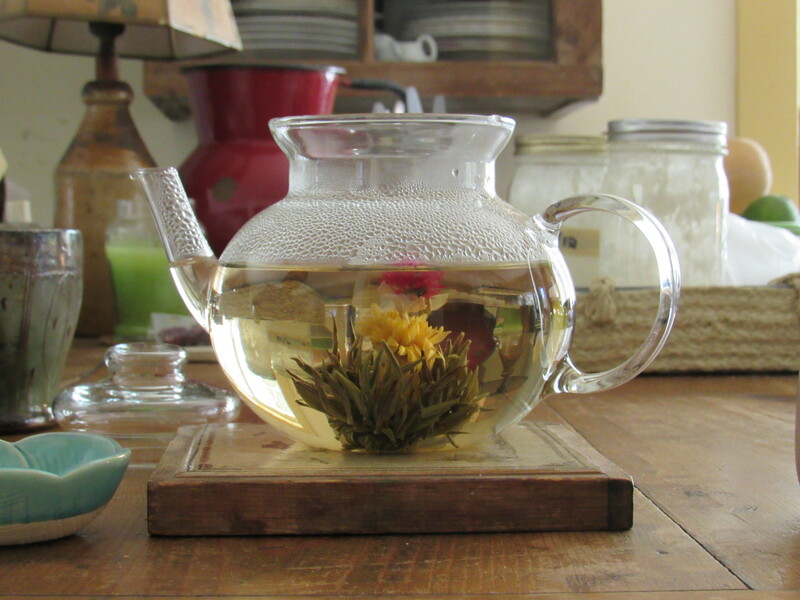 Of course, a glass teapot is essential for this type of tea. Magic! Delight! Surprise! And tasty! Thank you, Sid for that lovely day last winter. Sipping tea that blooms on a cold winter’s day ( with my pal, Sid)…it doesn’t get much better than that!